E3 came with a whimper, left with a… well it kind of left with a whimper too. That Kojima game that ended with a naked guy booty! The next Resident Evil is and isn’t going to be the PT demo. Final Fantasy had a big showing, but I haven’t felt committed to the franchise for a long time (I’m sure fans of the series were catered to though). VR was there, but it’s presence wasn’t as pronounced as I had anticipated. Horizon: Zero Dawn was something I’d forgotten about since last E3. Good to see it’s around. I’m always excited for more Mass Effect. ReCore was something I’d forgotten about since last E3. Looks like it’s... still there. Pokemon is Pokemon. Rowlet is cute, and I’m gonna buy it, but my hype train is still at the station. PokemonGo seems to have fallen flat on it’s face. I guess fancy trailers don’t really amount to much. That new Nintendo IP… Not exactly sold on it yet. Too chibi. Too same-y? No Mans Sky was absent. My biggest thing was the all new Elder Scr… er… I mean Legend of Zelda. I loved the amiibo support. I loved the openness. 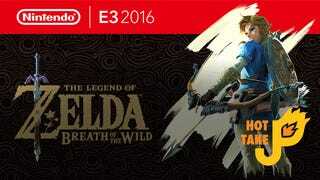 I loved the Koroks and how it seems that this will be the most lore-y Zelda yet! I loved the new mechanics and how the Shiekah Slate is now all the Zelda dungeon items in one. I’m curious about how they’ll handle inventory since items have durability now. OCD players will have a tough time using those special, rare items if they break after a few uses (will I be able to repair?!). Even if it’s borrowing everything from other games, I am more than ready for a proper evolution for the series.